“…We have the opportunity to make music for a living and travel around and put on shows and say things that we hope change people’s lives. To be able to do that at 27 and be able to make a living off of it and do what I’ve always wanted to do, I can’t help but stand amazed at that…” Releasing their debut album Come To The River in 2012, and featuring the smash hit “When Mercy Found Me”, and subsequent singles “All I Need” and “Come To The River”, Rhett Walker Band’s first Grammy nomination and first of several Grand El Opry appearances eventuated from this dynamic and musically diverse and eclectic debut album, which earned a special place in my heart as the album that was one of the first country albums I had listened to from start to finish. Now, two and a bit years later, their new album Here’s To The Ones drops; with 15 songs of country, southern gospel and CCM goodness. 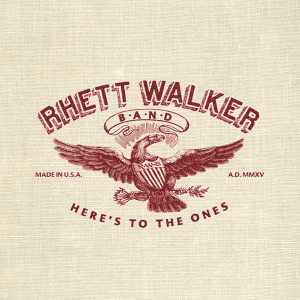 With “Broken Man” and the title track being the two singles, Rhett Walker Band have continued to stretch my musical preferences in so many ways. Ranging from radio pop hits to upbeat grunging guitar rockers; to slower twangy ballads, Rhett and co. continue to push the envelope and continue to mould my expectations as to how country music should sound like. With the band’s sophomore album showcasing some of the most vulnerable writing I have heard in 2014, this album is a must listen, regardless if you love country or not. You’ll definitely be blessed and inspired! Opening the track list is the 5 minute “Clone”. With hand claps, and a slow burn electric guitar crescendo, the 1 minute intro of Rhett’s father Mark Canipe- a pastor, reciting a poem (is it a Bible verse? It didn’t show up on google…) precedes a full on rock anthem led by vibrant electric guitar, complete with a stirring instrumental bridge. Sounding eerily like Jason Roy from Building 429 here, Rhett invokes a sense of urgency here, and relays that we as individuals should stand up for our uniqueness, and live like God intended, not living without questioning the status quo. Calling some people who meander through life ‘clones’, Rhett rebukes the notion of living like we’re only existing and breathing without meaning. Instead, Rhett reminds us of our purpose, and reiterates that some people may ‘…call yourself an outlaw but never fight for anything, sitting here waiting for them dollar signs, selling what we do not need…’, but because we have Jesus on our side, then our lives are worth more than any ‘mindless’ clone. While the first song was rock/country, the next is pure country. In fact there are a lot of pure country songs, and in the case of this album, they all work, and they all are catchy, which is rare as country isn’t my preferred genre. Maybe my tastes are changing? Anyway, “Here’s To The Ones” is a patriotic melody that thanks the people of America for everything they have done to make the nation great. A general and blanketed ‘thank you’ that has Rhett proudly reminding us ‘…here’s to the ones who stand their ground, here’s to the ones who never back down, oh, here’s to the home of the free…’; the track with a country twang in the electric guitar should get on my nerves, but it doesn’t. It’s strange, but for some reason, I can find myself identifying with the song, maybe it’s because there’s red, white and blue in the Australian flag? “Love Like Jesus” is a mid tempo guitar led captivating and inspiring ballad, about a simple concept of loving everyone we meet like how Jesus loved us, with Rhett fervently reminding us that we need to ‘…run like wild, while I’m breathing, standing strong as I press on and keep on dreaming, and love like Jesus…’, while “Adam’s Son”, possibly named that way as a reminder that we all have sin in our lives and have fallen short, but we all can be redeemed by God; represents the band’s first song they wrote ever as a band. A mid tempo rock track driven by the acoustic guitar, thematically the song reminds me of a cry for help and a cry for God to rescue to us, to deliver us from our weaknesses and ourselves. “Dead Man” is an in your face rock melody, designed to be our wake up call, as Rhett sings to a non-Christian friend or someone who’s fallen away from their faith, reminding them that without God, they’re a dead man walking, and that the choice is theirs if they want to accept God’s offer of a relationship and new life. Kudos to the band for recording a track that may be uncomfortable with people, however this song in my opinion is necessary, as I am sure many lives will be challenged and many will come to Christ because of this melody. “The Mystery”, an acoustic guitar only emotional and vulnerable slow tempo track, is the band’s Nicene Creed like song, with the chorus reminding us that Jesus doesn’t worry about our preconceived notions of faith and the appearance of it, but rather He wants our hearts to be pure in our pursuit of Him and His love. As Rhett gently reminds us that he wants to live a life that pleases Jesus; he later moves into gospel territory musically, with the song “The Other Side”, reminding me musically of tracks like “Amen” by Chris August and “Love Has Come” by Mark Schultz. As Rhett experiments with many genres, he and his band always put Jesus at the centre of their praises. With “The Other Side” sounding like a track sung with an African American gospel choir, the moving and inspiring words and the piano riffs all throughout, make this song an album highlight for me, especially when Rhett’s words are as plain as day when he sings out ‘…so lift your hands up, feel the spirit rising, join the celebration, raise your voice with mine, Lord hear us calling, calling for you Jesus, we feel you moving, from the other side…’. Such powerful stuff! While “Amazed”, a CCM and folk like mid tempo acoustic guitar tune, where we can sing along with Rhett as he emphatically sings out ‘…I wanna be alive, I’m gonna stand amazed…’; that he is amazed by God’s power and His work in our lives and the lives of those around us, there’s a myriad of genres and issues explored further in the last few tracks on the album. At a young age of 27, it’s surreal and a tiny bit unbelievable to think that Rhett and his wife have been married for 10 years, however the mid tempo acoustic guitar ballad “Better Part Of Me” is dedicated to his wife and the other band members’ wives, who sacrifice a lot for them and their music careers. Every marriage has their ups and downs, and this song beautifully encapsulates the notion that probably every husband and wife agree with, that in the end it is all worth it, despite the trials, as marriage is based on commitment, love and devotion, instead of fleeting emotions which change from day to day; as a man and his wife’s love for each other is only a fraction of the love that Jesus has for us, and that’s pretty amazing! While “Someone Else’s Song” was written at Panama City Beach, and reminds us that the life we’re living isn’t ours, but Jesus’s, putting in perspective the fact that we can stay true to ourselves without pressure from society and everyone else’s opinions, and not live someone else’s life, or live their calling; the standard edition album ends with the first single “Broken Man”. Released in February this year, this testimonial type guitar led mid tempo ballad is probably the most catchiest Rhett Walker Band song ever, as we are reminded that God loves everyone, regardless of our struggles and whether we are broken or not. As Rhett emphatically sings out in the chorus that ‘…I get lost, I get found, lose my way when I turn around, hit my knees, lift a prayer once again, ask for mercy, ask for grace, then I do the best I can, I thank God he loves a broken man…’, a sense of peace and calmness is evident, as we remember that God loves everyone regardless of where we’re been, but loves us too much for us to change. What an inspiring end to a thoroughly enjoyable album! The album doesn’t end there for those who are interested in the deluxe edition of the album. Though I’m not sure why any of these 4 tracks would be omitted from the standard version of the album. Maybe it’s a marketing ploy Anyway, “Lift Me Up” is a rock/country mid tempo guitar led anthem, as Rhett ardently asks God to lift him up and help him out of the mess he’s in in his life (reminding me of the story of Peter walking on the water- Matthew 14:22-33), while “Welcome Home” invokes feelings of security and warmth, as this radio friendly ballad speaks about longing for heaven, and eagerly anticipating entering the presence of Jesus. While this song could be wishing our life away, I see it differently, as the song is merely wanting to meet Jesus, and a reminder that our lives are nothing compared to the glorious splendour of heaven and meeting our Saviour face to face. With the final two tracks being a cover of the popular mainstream song “Taking Care Of Business”, a song for the working class man, meant to remind us that the ride to success is not easy by any means, and requires hard work; and a live version of “Gonna Be Alright”, from their first album; Rhett Walker Band have recorded a worthy sophomore album that I will be sure to play multiple times on my iTunes. No doubt this album will garner plays from fans who are non-Christians as well, and I hope and pray that God touches their lives from this faith-based music as well! Previous PostHeavenly MatchNext PostMessage Mondays And Throwback Tuesdays: The Most Intense Thunderstorm I Have Experienced (Casting Crowns’ “Praise You In The Storm”)! Thanks for the compliment Mark- and for the clarification! I just made the changes to reflect the new information! I’m yet to listen to all the songs on the album but with this review, I think it’s time to get the songs playing. I’ve listened to samples on itunes and it’s really good! And that’s just from the samples I highly recommend it. Thank Luc, I’m listening to a few tracks and it’s getting interesting. The album is pretty awesome! I think it’s better than their debut album! You’ll definitely love the album if you like all or any of the artists in the RIYL section! I agree with you Josh, it’s definitely better than their debut album.